A döner is the Turkish name for thinly sliced rotisserie meat usually served on flatbread. Spitz serves its döner meat—beef and lamb, chicken or mixed meats—on toasted lavash bread and pita as well as in bowls, baskets, rolled up as “doquitos” (similar to taquitos) and on salads. For those wanting lighter fare, it’s hard to improve on any of the döner salads ($12.60). 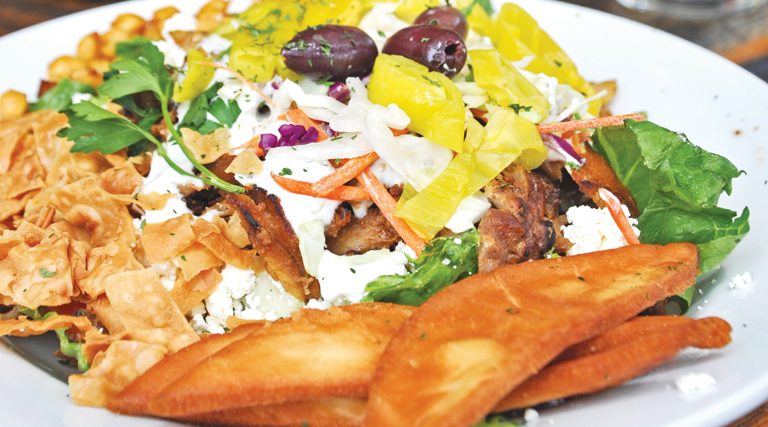 Your choice of döner or falafel is nested upon a bed of romaine lettuce and then topped with shredded cabbage, carrots, onion, green pepper, cucumber, olives, feta, pepperoncinis, tomato, tzatziki, fried lavash chips, fried pita and a side of housemade balsamic dressing. Choosing chicken for this salad imparts the savory smoke you expect of lamb and beef, but without the heaviness. Both light and dark chicken meats are marinated, formed in a cone, then roasted to create a chewy crispiness in each bite. Easily made to be vegan or gluten-free, this collage of greens and protein is a flavorful reminder of street food you might have eaten in your youth while studying abroad—only much healthier. It’s delicious adulting.